Clean and prepare the seafood accordingly. In a large skillet, add in 2 tbsp olive oil and ½ of the minced garlic and sauté until fragrant but not brown. Add in clams and ½ of the white wine. Stir briefly and cover with lid. When most of the clam shells start to open, remove lid and transfer to a plate. Discard unopened ones, if any. Add in remaining olive oil and garlic. Sauté until fragrant and add in prawns and squid. When the prawns start to turn red, transfer both ingredients to a plate. *it is ideal to leave the seafood undercooked as they will continue to cook in the oven later. Bring a large pot of water to boil and add in generous amount of salt. It should taste like sea water. Add in pasta and cook according to package instruction. Drizzle some olive oil to the same skillet and pour in the tomato sauce. Add in stock and the remaining liquid from the seafood. Bring to boil. Season with salt, sugar and pepper. When the pasta is done, transfer into the sauce along with the seafood. Toss well and turn off heat. 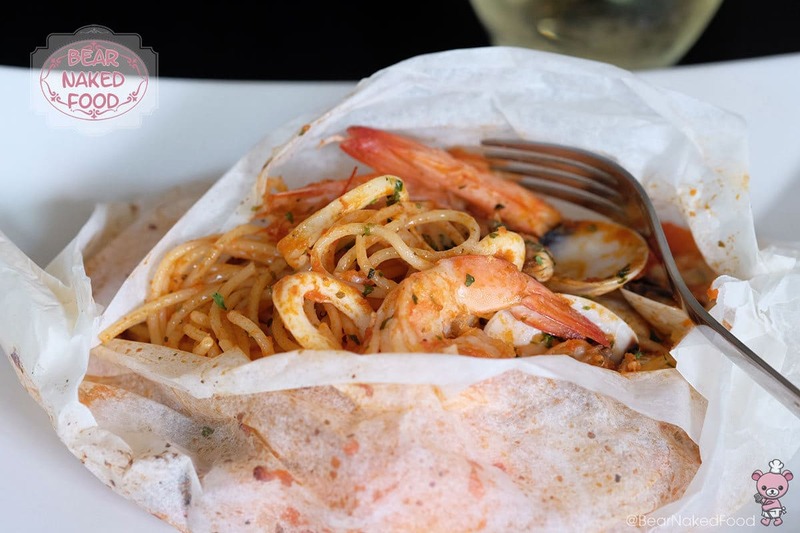 Distribute the pasta, seafood and sauce into each pouch. You'll want to have more sauce so the pasta will not dry out during the baking process. Wrap securely and bake in a preheated oven at 200°C/400°F for 5 – 10 mins. Transfer onto serving plate and let your guests unwrap the parcels themselves.